Natural Organic Rhassoul Clay & Chlorella Green Algae Facial Treatment! Purifies, Nourishes, Detoxifies and Conditions! This facial mask gives your skin a healthy glow! The organic clay and green algae promote a soft, smooth and toned complexion by drawing out blackheads and unblocking pores. It removes dead skin cells as it tightens pores as it fights free radicals and tightens pores! Deep clean, detoxify and rejuvenate! Tightens pores for healthy skin! Regulates your skin's natural oil balance! This clay from the Atlas Mountains in Morocco is considered to be more effective than other clays, as it contains high percentages of silica and magnesium. 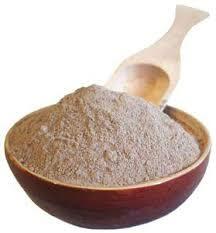 Mineral rich, it helps revitalize flaky or mature skin, improves elasticity and helps conditions such as eczema. Rhassoul clay draws out extra oil and impurities within the skin. 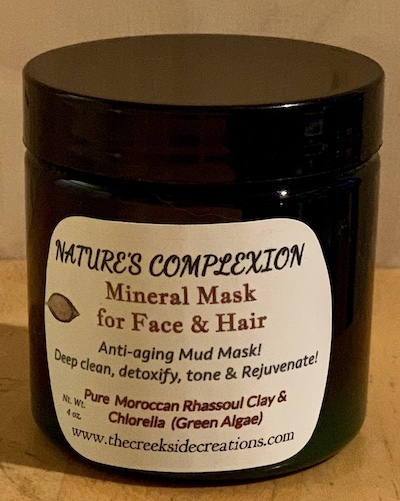 The high mineral content ~ including silica, magnesium, potassium and calcium ~ helps to improve skin clarity, reduce dryness, and remove blackheads, whiteheads & comedones. It improves skin elasticity and firmness, resulting in clean and radiant skin! Reduces inflammation, plumps the skin and fights damage from the sun! Works through all of the layers of skin to battle free radicals! Builds stronger, more resilient skin as it helps reduce the appearance of premature aging! Chlorella has powerful anti-aging benefits. A rich source of carotenoids, it is loaded with amino acids and essential building blocks that activate collagen. It will help to restructure and smooth out the surface of the skin. Studies show is has the ability to prevent the breakdown of collagen and generate the production of more collagen. Nutrients include: Chlorophyll, Vitamin A, Folic Acid (Folate), Vitamin B12, Iodine, Vitamin K1 and Iron, Riboflavin (Vitamin B2), Manganese, Vitamin C (ascorbic acid), Biotin (Vitamin B7), Vitamin B6, Thiamin (Vitamin B1), Phosphorus, Vitamin E, Magnesium, Panthothenic Acid (Vitamin B5), Copper, Potassium and Zinc! Application for Face: Use a wooden or ceramic bowl/spoon. Metal reacts with the minerals in the clay, so avoid it when preparing your mask. Mix with simple water, or better yet, apply with The Creekside Creations “Splash and Oil Facial Kits” to benefit from the perfect hydrosols and oils for different stages of your skin: Normal, Mature/Dry, Oily/Acne, or Sensitive skin! For oily times or stressed skin, mix with your Splash and Oil Hydrosol or any favorite Creekside Creations’ Organic Hydrosol. For dry times or damaged skin, mix with Splash and Oil Facial Oil or any favorite Creekside Creations’ Facial Oil. Warm water can also be used for mixing and use. Apply a thin, smooth layer on the desired area (face, neck, even hands). Avoid the eyes. Let dry for 10 - 20 minutes and rinse well in warm water (If mixing with facial oil, mask does not harden completely). Do not let your mask dry fully in order to preserve facial moisture. You should feel a tightened feeling; the clay should look wet on top. If it gets dry, occasionally spray your face with a hydrosol to keep it moist and help absorb the mask’s nutrients. Use a cloth that you don’t worry about getting stained to wash off. Your skin might look a bit red after use, but will return to normal after 10-15 minutes. This clay may also be used as a hair mask! Rhassoul is an excellent fortifier for the scalp and hair, reducing the secretion of sebum. It cleans and makes hair soft, silky, and shiny. It exfoliates dead skin and balances sebum secretion to fight off dandruff. Excellent for dry scalp, damaged hair, frizziness, heat damage, or lack of shine! Chlorella stimulates the production of keratin.. Its elements have the ability to promote hair growth and renew hair follicles. It is effective in the prevention of hair loss. 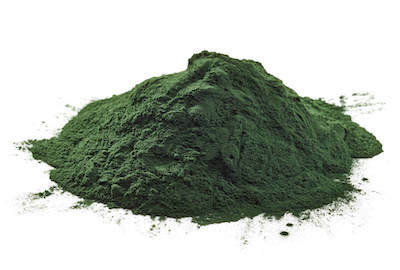 The phytonutrients in chlorella will strengthen hair follicles and boost scalp circulation. Application for Hair: Mix with water to make a thin paste. Apply the paste to wet hair from the roots to the tips; massage for a few minutes. Leave until almost dry, Rinse abundantly with warm water. Use once a week. This 4-oz. jar will last approximately 6 weeks when using 1 - 2 applications per week. Click the button below to add the Nature's Complexion © Mineral Facial Mask to your wish list.